Notebooks at the ready for Baking 101, with this simple white loaf recipe. 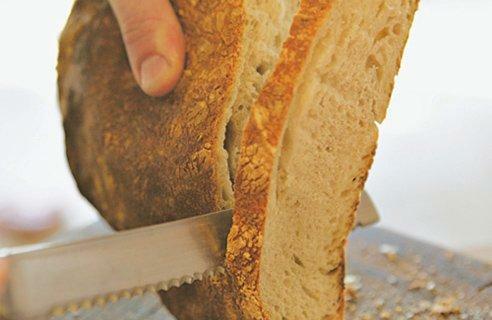 Once you've mastered basic bread, you'll be a fully proven baker. Combine the flour, yeast and salt in a large bowl. Add the oil, if using (not essential, but it makes for a slightly softer, more supple crumb), then add the water. Stir to create a rough, sticky dough. The dough really should be quite sticky at this stage – if it isn't, add a splash more water. Turn out the dough on to a lightly floured surface and knead for about 10 minutes, rhythmically stretching the dough away from you, then folding it back on itself. The idea is to stretch and develop the gluten within the dough, not to beat the living daylights out of it. Avoid adding more flour if you can: the dough will become less sticky and easier to handle as you knead, and a wetter dough is generally a better dough. When the dough is smooth and elastic, form it into a ball, coat it very lightly with oil and place in a clean bowl. Cover with cling film or put inside a clean bin-liner and leave in a warm place until doubled in size - in the region of 1½ hours. Tip the dough out on to a lightly floured surface and deflate with your fingertips. Reshape the dough into neat rounds and put on a lightly floured board to prove for around 45 minutes. Meanwhile, preheat the oven to 250°C/gas mark 10, or its highest setting. Put a baking tray in to heat up. When the loaves have almost doubled in size again, take the hot baking tray from the oven and sprinkle with a little flour. Carefully transfer the risen loaves to the tray. Slash the tops with a sharp, serrated knife and put in the oven. Bake for 10 minutes, then reduce the heat to 190°C/gas mark 5 and bake for about 30 minutes more, or until the crust is well-coloured, and the loaf sounds hollow when you tap it sharply with your fingers. Transfer to a rack to cool completely before slicing.